Next Video Twitter is a Conversation - Get in on it! “That time of year,” when you pull out the holiday decorations and the holiday excuses for not working, is coming, and it’s coming fast. 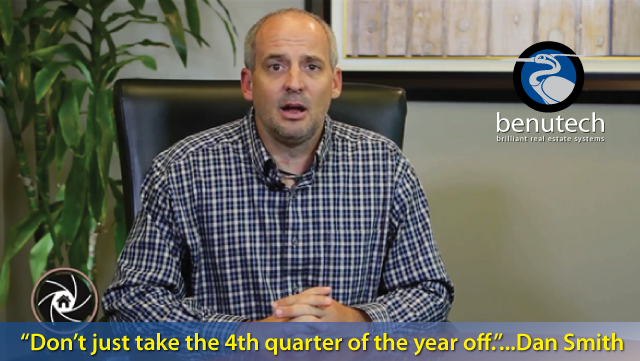 We’ve just entered the fourth quarter of the year, and as real estate coach Dan Smith emphasizes in this latest episode of Real Life Real Estate, the fourth quarter is the most important quarter, not just for this year, but for next year too. 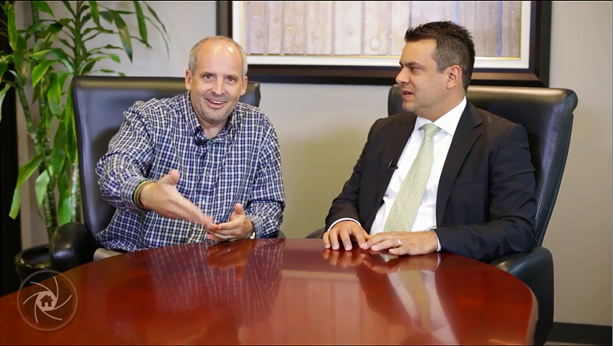 Needless to say, if you want your business to succeed and grow in the new year, you should watch this video now, before any more of Q4 passes you by. Welcome to another episode of Real Life Real Estate. My name is Dan Smith. Thank you for tuning in to ReboReports. We appreciate it. This week, what I want to talk about, as we’re moving now into the fourth quarter, right, we’re at the beginning of the fourth quarter, and guess what a lot of real estate agents are going into… “It’s time to stop working” mode. “There’s no business to be done” mode. “I’m getting into the holiday” mode. “There’s nothing to do right now anyway.” And so I’m here to tell you that is incorrect. There is a lot of business to be done. In fact, if the last week you were a little slow, so you’re thinking to yourself, “oh, it’s slowing down so I’m going to take some time off now, and I’m going to go back at it in January,” I’d like you to go back and do a one or two week search on the MLS, and look at all the new opens. All the new opened escrows or pending sales. I’d like you to look at all the closed sales. And I’d like you to look at all the new listings. How many new listings have come on the market in the last week or two weeks? You will be amazed. There is still a lot of business going on. Now, unfortunately perhaps, none of it is yours. Ok? But that does not mean you give up now. That does not mean you just pack it in for the rest of the year, because here’s the thing about the fourth quarter. It’s actually the most important quarter of the year. Let me tell you why. See, there’s four quarters in a year, and the last one is October through December. And that’s the one that real estate agents, because we’re independent contractors, tend to take off the most. But here’s why it’s the biggest mistake. It’s the most important because it actually really counts for a couple of months. A couple of quarters. See, if you have, if you don’t show up for work in the fourth quarter, you’re not going to make any money in the fourth quarter, because you can’t make any new sales. So October, November, December, you kind of run out of money, you use everything that you saved through the summer, use everything that you’ve stockpiled up, and now you don’t get to have as great of a Christmas or a holiday season as you might have, because you didn’t work. And then, it’s a double-whammy, because January, February, and March, the next quarter comes around, but because you didn’t work in October, November, and December, you don’t have any business in January, February, or March either. So, it double-whammies you. And this is a constant cycle that real estate agents find themselves in. And you guys, October, November, December, January, February, March, that is six out of a potential twelve months that you’re not really making any money or getting any paychecks. So here’s what I suggest. Work in October, November, and December, and make some money, and then that will also lead to you having business in January, February, and March, and make some more money, and do you know what that’s going to do to your mindset? It’s crazy, I mean I don’t even know how some of you do it, to be perfectly honest. You get so beat up in October, November, and December because you don’t have any income, and you’re not achieving your goals. Ok. So you end the year on a sour note. And then you start the next year fired up on January 2nd, you’re ready to rock and roll, but then you don’t get any checks, because you didn’t do anything in the previous three months to earn those checks. And then January, February, March, you get beat up again. It’s the double whammy. This quarter followed by this quarter. And you finally start making a little bit of money in April, and then by September you’re closing up shop again, and you do this cycle over and over and over. If you just worked the fourth quarter, it sets you up for a great first quarter, then your second quarter wouldn’t be playing catch-up, your second quarter’d be getting ahead of the game. And your third quarter would be getting really ahead of the game. And then hopefully you won’t take the fourth quarter off, even though you’re really ahead of the game. This is how you become a successful real estate agent. This is how you become an agent who doesn’t just do 6-10 deals a year, this is how you break through into doing the 30-40-50 per year. You have to work all 12 months, guys and gals, in order to do that kind of business. So, the fourth quarter is upon you. I always end my messages with this little saying, “to get what you’ve never had, you must do what you’ve never done.” For you, this particular week, this particular year, that might be to have a chance at actually achieving the goals I set for myself this year, to have a chance of achieving next year’s goals I set for myself. Perhaps I should work the fourth quarter, I’ve never done that, and then I’ll have some production in the first quarter, and I don’t start behind the 8-ball. To get what you’ve never had, you must do what you’ve never done. I want you to think about that. Ok? And think about the changes you need to make to get the things you’ve never had. Now, this fourth quarter I am going to be speaking a little bit here and there. Ok? Unfortunately, a lot of real estate agents do take off, so I don’t speak as much, but I do have a few workshops and seminars that I’m doing. Some of them are as little as $20 to attend. If you’d like to find out more about them, go to my website. Versatilityinsales.com, on the right hand side it says “Upcoming Events,” go ahead and click on that and it’ll take you to a place that talks about when and where and what they’re on. You can make any decisions, make the decisions if any of them are right for you. Budget-wise, they’re all going to be right for you. Like I said, some of them are going to be as low as $20. And do that this week. See if there’s some, some training or seminar you want to go to. Ask yourself that tough question. “Am I doing something different so that I can get something different?” And then actually, that’s the most important part, go out there and execute with that mindset. Go out there and actually do something different, don’t just think about it. Have yourself a fantastic amazing out-of-this-world best one you’ve ever had fourth quarter, and I promise you, I guarantee you, you will also have the best first quarter you’ve ever had. next Twitter is a Conversation - Get in on it!